This short learn English practice exercise is both cute and inspiring. It's also very short so it's great to watch it 2-3 times to really practice your listening skills and have a chance to learn new vocabulary. (P.S. You’ll learn 10 new vocabulary words and phrases too). To start this learn English practice exercise, watch the video and then review the transcript and vocabulary notes afterwards. Then try watching the video a second (or third) time so you can hear the vocabulary and phrases again. It's a very short video. 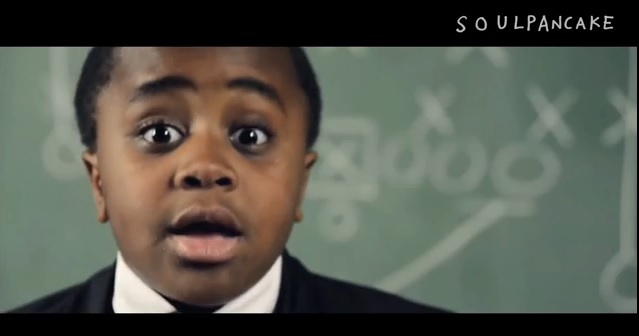 Kid President: I think we all need a pep talk. I think we all need a pep talk. The world needs you to stop being boring. Yeah, you. Boring is easy. Everybody can be boring. But you’re gooder than that. Life is not a game, people. Life isn’t a cereal either. Well, it is a cereal. And if life is a game, are we on the same team? I mean really, right? I’m on your team, be on my team. This is life people. You got air coming through your nose, you got a heartbeat. That means it’s time to do something. A poem: Two roads diverged in the woods and I took the road less traveled and it hurt man! Really bad! Rocks, thorns, and glass… My ..... broke**! Why? Not cool Robert Frost! But what if there really were to paths? I want to be on the one that leads to awesome. Just like that dude in Journey said, “Don’t stop believing, unless your dream is stupid, then you should get a better dream.” I think that’s how it goes. Get a better dream then keep going, keep going, keep going, and keep going. What if Michael Jordan had quit? Well, he did quit. No he retired. Yeah, that’s right, he retired. But before that, in high school, what if he quit when he didn’t make the team? He would’ve never made Space Jam and I love Space Jam. What will be your Space Jam? What will you create that will make the world awesome? Nothing if you keep sitting there, that’s why I’m talking to you today. This is your time, this is my time, this is our time. We can make every day better for each other. But if we’re all on the same team let’s start acting like it. We got work to do. We can cry about it or we can dance about it. We were made to be awesome. Let’s get out there! I don’t know everything, I’m just a kid. But I do know this: it’s everybody’s duty to give the world a reason to dance so get to it. You’ve just been pep talked. Create something that will make the world awesome. Play ball. Oh, hi everybody. We’re all working hard to make this an awesome year for other people. And you guys are doing it! You’ve been super encouraging to me so I wanted to return the favor. Who do you know who needs some encouragement? Pass this pep talk along and let’s get the whole world to dance. I’m dedicating this video today to my friend Gabby. She’s a cool kid, she likes pancakes, and she’s fighting cancer like a boss! And to all you watching, who encourages you? Send them this video and let them know. So get to it! Kid President says, "A poem: Two roads diverged in the woods and I took the road less traveled and it hurt man! Really bad! Rocks, thorns, and glass… My ..... broke**! Why? Not cool Robert Frost!" I couldn't understand what Kid President said. Kid President (his real name is Robby and his sister Lexi) have a rare brittle bone disease known as osteogenesis imperfecta. It means his bones break really easily so he may be talking about a particular bone he broke out in the field. In the first 9 years of his life (he did the video when he was 9), he had broken more than 70 bones. cereal (noun) - a breakfast food made from grain such as corn, wheat or oats. Kid president says, “Life is not a cereal”… then he remembers that, yes, Life is actually the name of a famous breakfast cereal brand. diverge (verb) - to go out in different directions from a common point. thorn (noun) - a sharp point on the stem of some plants. quit (verb) - to stop doing something. retire (verb) – to stop working, usually when you have reached a certain age (e.g. 65) or decide to stop doing a particular activity (e.g., athletes often retire from their sport but then start doing other work later). Space Jam – a animated sports comedy film starring former basketball star Michael Jordan and the Looney Tunes characters (from 1996). duty – a responsibility, task or action that someone is required to perform. encourage (verb), encouraging (adj), encouragement (noun) - give someone courage, confidence or hope. To inspire or support someone to do something. like a boss – to be like a boss (another word for supervisor or manager) is like being a person who is in charge and take care of things. return the favor - to do something similar for someone who has done something good for you. I really hope you enjoyed this learn English practice exercise. If you would like to watch other inspiring talks, please check out my TED Tuesday's page, where I create short lessons based on TED Talks. It's a great way to practice and improve your English. Best wishes with your studies and I hope you give the world a reason to dance! Return from this learn English practice video to the homepage or main videos page.